The FTD® Holiday Elegance™ Bouquet by Vera Wang offers your special recipient sophisticated styling to celebrate the splendor of the holiday season. 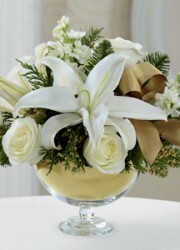 Snowy white roses, stock and Oriental lilies are artistically arranged amongst holiday greens and gold ribbon to create an impressive flower arrangement. 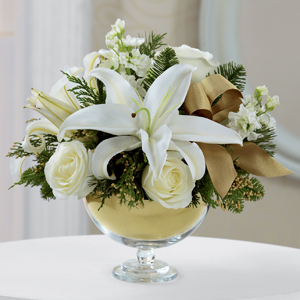 Presented in a designer clear glass pedestal vase, this holiday flower bouquet will be the perfect addition to their home, office or Christmas table in celebration of this highly anticipated holiday season.